Does Your Church Have a Prayer? presents a model of revitalization, transformation, and discipleship for congregations to fulfill Jesus' prayer in John 17. Your church can move from maintenance to mission, from defending current realities to living into a joyful future. The authors provide pastors and church leaders with a step-by-step planning guide that will equip them for the task of leading the church in a scripturally grounded visioning and strategic ministry planning process. "Every church has a prayer," they write. "Envisioning a promised land of discipleship, Jesus prayed his followers would live in joy and unity to the glory of God. 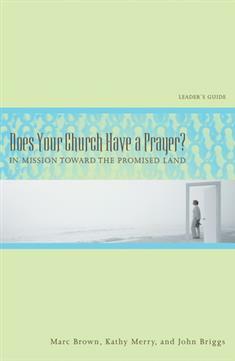 …Your church has a prayer for entering the promised reality for which Jesus prayed. People in your community of faith can live a vision of faith." This Leader's Guide begins with biblical examples of spiritual leadership. Brown, Murray, and Briggs offer important thoughts on choosing, equipping, and encouraging leaders to collaborate in discernment. By applying biblical principles, churches will move from inward focus to ministry. The time has come for your congregation to make intentional choices about its present and future. Live your way into transformation. As one reviewer says, "Implementing the learnings from this book will take a congregation where it has never been before. The promised land awaits." Companion resource to the 6-week study Participant's Workbook.